Romanos Alyfantis goes into the men’s 100-meter breaststroke with the year’s second-best time, 1.00.39, among 56 entries. The European Swimming Championships begin today in Eindhoven, the Netherlands with the Greek team hoping for big performances from two team members on opening day. Romanos Alyfantis goes into the men’s 100-meter breaststroke holding the second-best time this year, 1.00.39, among the event’s 56 swimmers registered to compete. Norwegian swimmer Alexander Dale Oen has clocked the best time this year, a 1.00.34 performance. The Greek team will also be looking at a solid performance from Aristidis Grigoriadis in the backstroke. Grigoriadis, who finished third in the men’s backstroke at the previous Europeans two years ago, is ranked fifth among 44 entries with a time of 54.75 seconds. Also today, Irini Kavarnou goes into the women’s 50-meter butterfly event ranked 16th among 43 contestants with a time of 27.30. 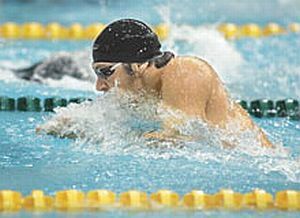 Competing in the men’s 50-meter butterfly, Sotiris Pastras is ranked 26th among 51 entries with a time of 24.80. Vassilis Demetis, who has registered for the men’s 400-meter freestyle, enters the event ranked 21st among 31 swimmers with a time of 3.53.50. One of the Greek team’s youngest members, Aspasia Petradaki, aged 15, will compete in the women’s 200 meters with a time of 2.19.17, the 15th best performance this year among 23 entries. Greece, a country without a winning tradition in international swimming competition, tallied a respectable five medals – two silver and three bronze – at the previous European Championships in 2006. There were also a further five finalists. Though this summer’s Beijing Olympics ranks as the premier event on the international swimming calendar this year, these Europeans stand as the year’s prime objective for most Greek swimmers, because they have more realistic chances of raking in medals here. Times have been severely slashed at international-level swimming, the main undercutters being American and Australian swimmers.